What happens when you can’t let go of your grief? What happens when it consumes you? When it becomes all that you have left? What do you do? Where do you go? What do you become? Nina has left her husband Matt and her daughter Molly. She is going back to Malta with her son Christopher to visit her parents one last time. But she is also going home to Malta to confront the ghosts of her past. Ostracized and cut out of the family when she became pregnant out of wedlock, Nina seeks to mend her relationship with her parents; and if she is lucky, she will be able to mend her heart. But Nina carries with her more than just hope and grief over her past. Nina carries with her a secret that, should she choose to acknowledge it, will shatter her world even further. When she arrives in Malta, there is more than just her past waiting for Nina. There are also the dead. Malta has always been a stomping ground for spirits; and Nina has always been able to see them. A seer from a young age, she has always seen the dead that come to Malta to heal. But now the dead come to her so that Nina can begin her healing. There is so much I want to say about this novel, but I don’t have the right words to do the novel justice. Not only the novel a beautiful story about love and loss, grief and circumstance, it is also a haunting reminder to live life to the fullest every single day we can. Smailes, who is no stranger to delving into the darker side of the human psyche, has given us a multi-faced heroine in Nina. Here is someone we can ache for, someone we grow to care about and grow to know over the course of a novel. You would think that someone obsessed with her grief would grate on your nerves, but that is not the case here. Smailes juggles Nina’s emotions with a deft and subtle grace that leaves the reader not only empathizing with her but sympathising with her as well. Everyone has done something they regret. Everyone has lost someone they love. Smailes manages to tap into that vein and give us a novel that is filled with real, true emotion captured on the page. Like Bees To Honey is so good that it took my breath away. I was surprised by how funny the novel was. You would think a novel about the darkness of grief would be hard going, but that’s not so. The novel is full of emotion, yes, but it is such an incredibly human novel. It reminds us of what matters, of the simple things that bring joy. Like Bees To Honey is beauty captured on the page in words. Like Bees To Honey is also a novel about language. Much like Smailes earlier novels, language plays a big part in Nina’s unfolding story. Nina feels that she has lost her language, that she has lost her home. She tries to find it again in speaking her mother tongue. Maltese is sprinkled through out the novel with handy translations for those who don’t speak it. The language is almost like the music of the novel. Each time I found a Maltese word, I found myself repeating it, wondering at is shape and it’s sound. Smailes, who is conscious of every word on her page, has placed these words notes, this word music, through out the novel, giving it perfect pace and perfect pitch. I think the thing that is so delightful about Like Bees To Honey is that everything about it is so completely unexpected. Nothing is as you think it is and the story will not go at all how you think it will. Surprises wait for you, and for Nina, around the turn of every page. I was surprised by Like Bees To Honey constantly and each surprise was a lovely shock to my system. It’s been such a long time since I’ve been so emotionally affected by a novel. Like Bees To Honey not only touched my heart and my emotions; it touched my spirit. 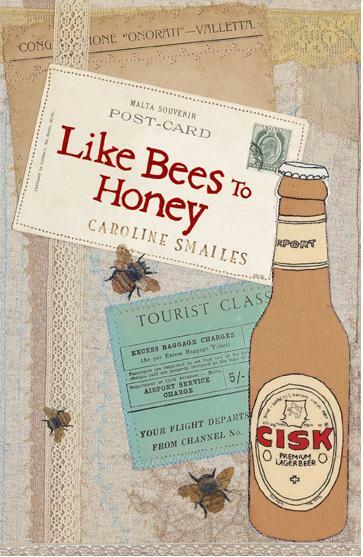 Beautiful, funny, moving and haunting, Like Bees To Honey by Caroline Smailes is no mere novel. It is a gorgeous, life changing experience, just waiting to enthral you with its beauty. Let Like Bees To Honey cast its spell over you. It will haunt you well after the last page is turned.